Murray cod float boat fly fishing! Thinking about giving flyfishing for Murray Cod a go? Winter is the perfect time to get all your tackle together and build up the fly collection. Perhaps you could work on getting some casting tuition, working it all out on the battle field can cause a lot of unnecessary frustration. Although it’s still possible to successfully target Cod during the colder months, I’ve found that there tends to be a lot of casting in between fish and I’ve also developed a bad habit of accidently falling in the river. Knowing that our fishing adventure opportunities will dwindle over the next few months, Jason and I hit the rivers with a vengeance. As usual we start the day with a bit of bantering, leading to a debate on who’s going to nail that elusive one metre fish. How obsessed are we? We’ve even worked on camera poses and photo angles for when it does eventuate. Words from Nick! Cod Pig the name says it all, one pig of a fly! Tied on a 5/0 Owner hook and a limited of amount of material the Pig is one to add to your collection. Most fish spend the majority of their time feeding underwater. Force yourself to become proficient and subsurface fly fisher; you will increase your catch tenfold, as a result especially early in the season, also experiment with other fly line as I do recommend intermediate line for best results. You will become a far better angler by mastering underwater presentation of a sub-surface fly. Sub-surface flies often used to represent an assortment of feed that make up a Murray cod diet. These flies are available to mimic many bait fish, crayfish and some are unique attraction patterns. The pig being a versatile fly; long, short or tight strips are a very effective way of presenting this fly. Being an aggressive fish, Murray cod are not that fussy on the presentation of a fly that is appealing to them. Once a pattern is found that creates a strike by fish, pay attention to how the fly is being fished. 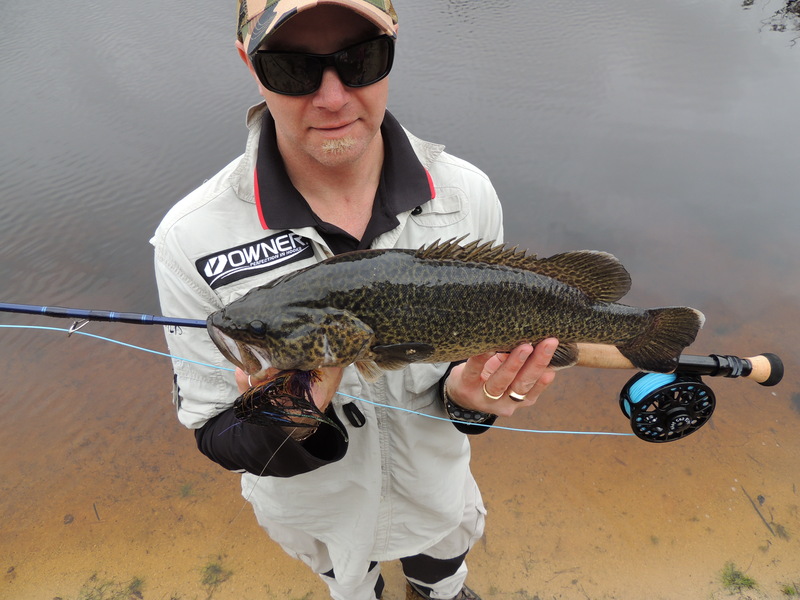 Murray cod are quickly becoming a favourite species for fly fishing anglers to pursue since they are readily available in most states and take surface and subsurface presentations very well.